Does the dryer eat your socks? My kids and I have always blamed our missing socks on the sock monster that must live in our basement! Dawgs has introduced Snappy Socks to solve the never-ending missing sock mystery with a new line of fun and fashionable buttoned socks. Available in a variety of unique prints, colors and patterns, Snappy Socks give you the satisfaction and convenience of never having to worry about searching for a missing sock again. 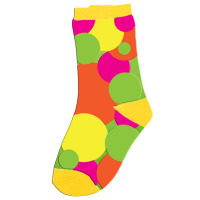 Snappy Socks are available for the entire family: infants, toddlers, children, youth, women's and men's! My kids, especially my daughter, love fun and funky socks and would love to own every pair of Snappy Socks! The colors and patterns are fun, bright, bold and fashionable! They are soft and comfortable! They snap together, no more folding or lost socks! This giveaway will end October 22nd at Midnight EST. Disclaimer: I received a complimentary pair of Snappy Socks for the purpose of writing a review and hosting a giveaway. Regardless, I only recommend products or services I use personally and/or believe will be a good fit for my readers. The views and opinions expressed on this blog are purely my own. Results may vary. No monetary compensation was received. 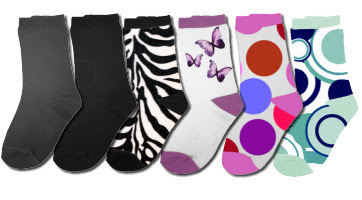 I love the Animal Print-Cow Black Sock for women. Colored Toe, Heel & Top-Yellow White Sock, Yellow Trim for Women. I love the Women's USA Flag with Blue Trip socks! The kids' Polka Dot in Purple! I like the Men's vertical pinstripe black, 3 guys in the house so these would be great.my dryer does eat socks! terri.moore30@yahoo.com thank you! Love the toddler loose leaf socks!